I hate camping. There, I said it, and now everyone knows the ugly truth. Just because I love the outdoors—just because I love hiking, trekking, and outdoor sports—it does not follow that I must also love camping. I’m not sure where this assumption comes from, but apparently it’s from those “true” outdoor gods and goddesses who embrace everything about the great wild and don’t mind planning, navigating, hauling their food, pitching their tent, cooking, cleaning, and going without a toilet or shower. Good god, that’s just too many commas. I want to go outside, enjoy the fresh air, exhaust myself with my chosen outdoor activity, then wash away the sweat with a nice hot shower. I want a shelter that does not require assembly, food that hasn’t been freeze dried, and a bed that hovers above the hard earth. I want a toilet that doesn’t require me to squat and tickle my tush with high mountain grasses. Is this is too much to ask? Yet, there are scores of places in this great wide world that you simply can’t visit without making some sacrifices. I guess this is where trekking started for me—it was a compromise. It was my way of saying: okay, I’m willing to give up a few creature comforts, so long as I can hire someone to take care of a few of those commas. Sure, I may still have to go without something that I consider crucial, like a proper toilet and a shower (oh, how I’m going to miss that shower! ), but at least I don’t have to go whole hog. Some treks don’t require sacrificing too much; however, others are more like “true” camping, but with extra helping hands. This trek falls into the latter category. 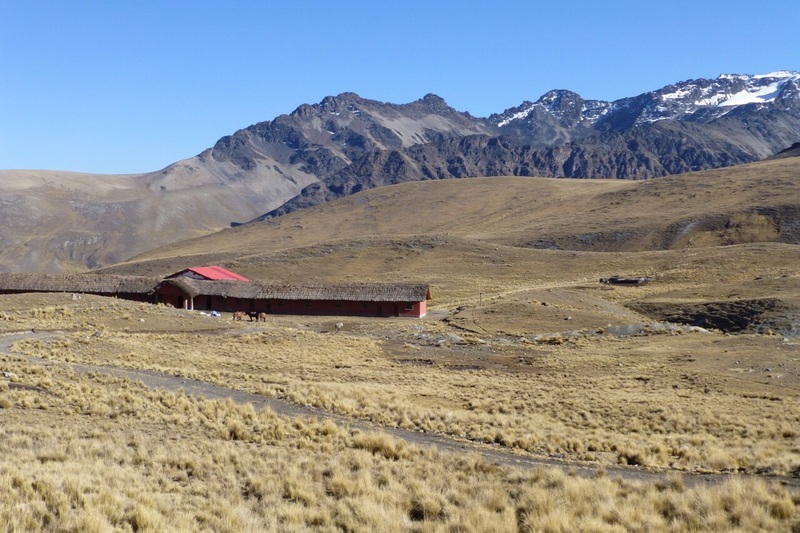 About the trek: the Cordillera Real, also known as Bolivia’s “Royal Range,” is a part of the Bolivian Andes and has more than 600 peaks, many of which are above 16,000 feet. 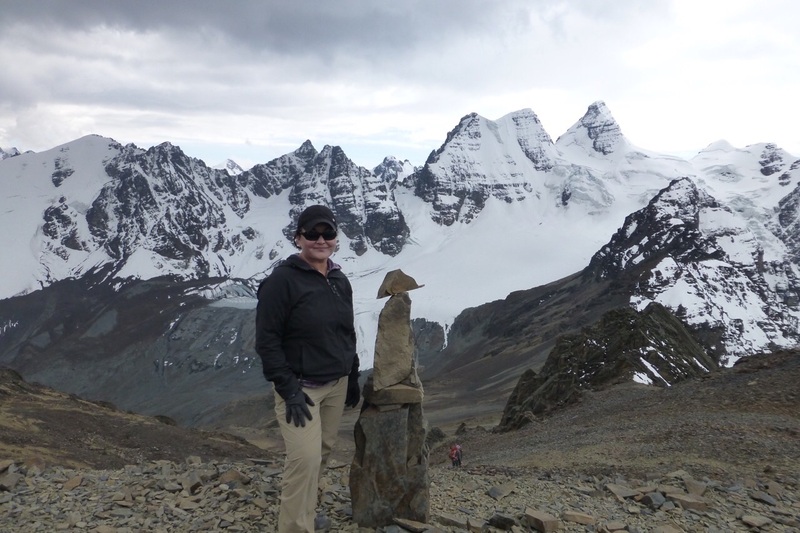 At this time of year (the dry season), some of the peaks are covered in snow and require technical gear, but many are not and are accessible with a bit of effort. This trek meanders below snowline, mostly hovering between 14,000 to 16,000 feet, but culminating at a high point of 17,454. The trek begins. I am joined on this adventure by Ryan and Tara, a fun couple from Colorado (Americans—a rare treat while abroad! ), who I met yesterday on our acclimatization day. 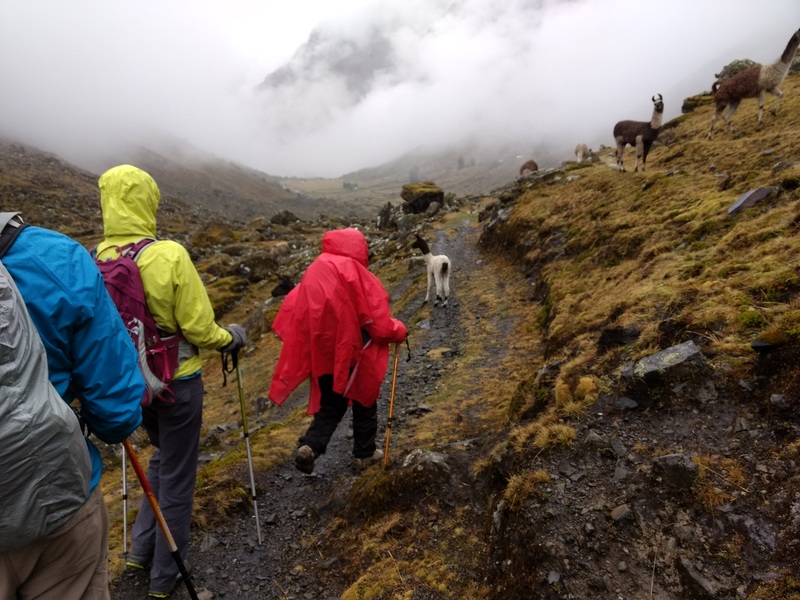 We meet our guide and cook, Marisol and Poncho (respectively), and drive to the starting point of the trek, where we’re to rendezvous with our muleteer (I guess that’s like a mouseketeer, but for mules). Mr. Muleteer is nowhere to be found. Remembering my last trek, I briefly wonder if I’m bad luck when it comes to donkeys. The good news is we’re above treeline, so the chance of donkeys being struck by lightning while tied to a tree is zero, so I can rest easy on that count. Unable to wait any longer, we begin the trek without him. It’s exhilarating to be in the mountains again. The sun is out, making it warm enough to trek without a jacket even at this altitude. I feel bouncy and ebullient in the crisp mountain air until we hit our first ascent. After nearly a month in La Paz, I never did stop panting when walking uphill—now we’re a few thousand feet higher and I feel like my heart is beating out of my chest. I dial things down a notch and adopt a rest step to keep my heart in check. In just a few short hours, we encounter a whole range of high mountain terrain: stream crossings, hard soil with dense clusters of brushy grass, massive swaths of scree, marshy highlands with spongy moss, and a whole lot of boulders. To me, bright-eyed and bushy-tailed, it all feels fresh and new and wonderful. After five hours of trekking through this wilderness, we reach our first camp where a substitute muleteer awaits with our lovely little donkeys. The camp itself is a pleasant surprise, too. I researched this trek beforehand to determine its level of “camp-iness”; that is, just how much sacrifice would be required of me before I was utterly miserable. I expected tent camping every night, so when we saw a large, empty wood structure—complete with separate rooms—it was a real treat. It was originally built for trekkers, but apparently isn’t being used. To one side of the camp is Ajuani Lake; clear, blue, and pristine. To another side is a rudimentary stone outhouse with a toilet and even a toilet seat. We all get excited over this discovery. You have no idea what a rare gem a toilet seat can be. Summary: Two mountain pass crossings at a high of 15,750; 5.5 hours. Crikey was it ever cold last night. Mountain weather can be wildly variable and hard to predict—warm when the sun shines, bitterly cold when it doesn’t. I thought having an actual roof over my head would mean I’d be warm, but the wind blew through the wooden planks and I could barely sleep between shivering and willing myself to not go to the bathroom. The trekking office told me to expect a temperature range between 23 to 40 degrees each day of the trek, but I’ll let you be the judge: I have a down sleeping bag that will keep me warm to 15 degrees. I have a silk liner that adds a few extra degrees, so I should be warm down to 12 degrees. On top of that, I’m wearing a wool base layer and wool socks. Yet, I felt like I was running naked in a snowstorm all night. Let’s hope that’s as cold as it gets. Today’s trek takes us over two passes. Recalling my performance on the ascents the day before, I take some coca leaves from our tea stash and try chewing them while I trek. I know this is something the locals do for a bit of extra ‘oomph,’ but I don’t really notice a difference. It’d be nice if each of our ascents built upon the last, taking us gradually higher and higher; but alas, they don’t. Every ascent is inevitably followed by a steep descent on scree that looks like a mountain of dragon scales. Nevertheless, I’m in love with this trek so far—not just because of the landscape, but because of the sheer lack of people and civilization. Typically, popular treks are full of other trekkers and you inevitably run into them and the facilities that support them. So far, we haven’t seen a single trekker. What we see are things that belong here: the occasional indigenous farmer or shepherd; llamas grazing lazily on grass, curiously craning their long necks to catch a glimpse of the intruders; stone homes that look ill-equipped for the mountain weather; random cows…but no one like ourselves. 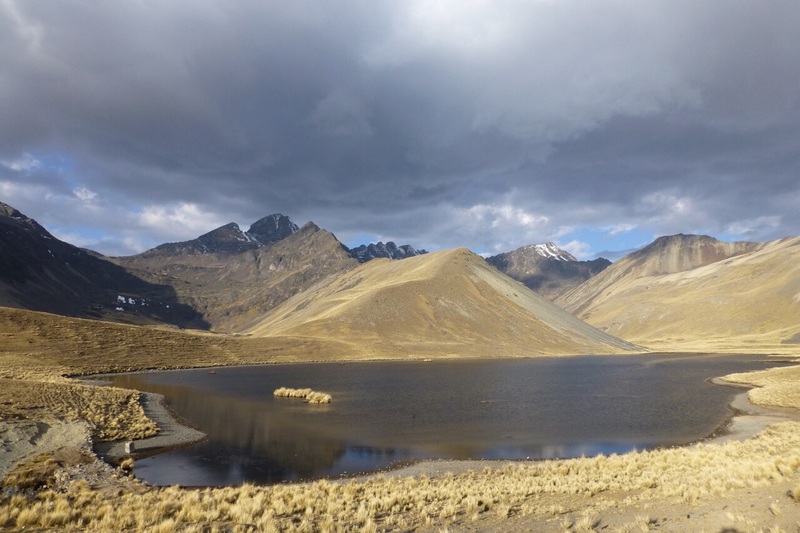 It feels special, like this corner of the Andes is ours for a private viewing. As we continue trekking and admiring the landscape, Marisol points out a peak that was a glacier only fifty years ago. Now, it’s completely melted down to rock and scree. It makes me wonder how much of a climate change debate we’d have if people were forced to leave the comforts of their city homes. We arrive at tonight’s camp, which borders another clear blue lake. Indigenous women are there, untangling their fishing nets so they and their fishermen partners can row out and cast them in the lake. In the morning, they’ll retrieve the nets full of fresh lake trout. We buy some for our next evening meal. 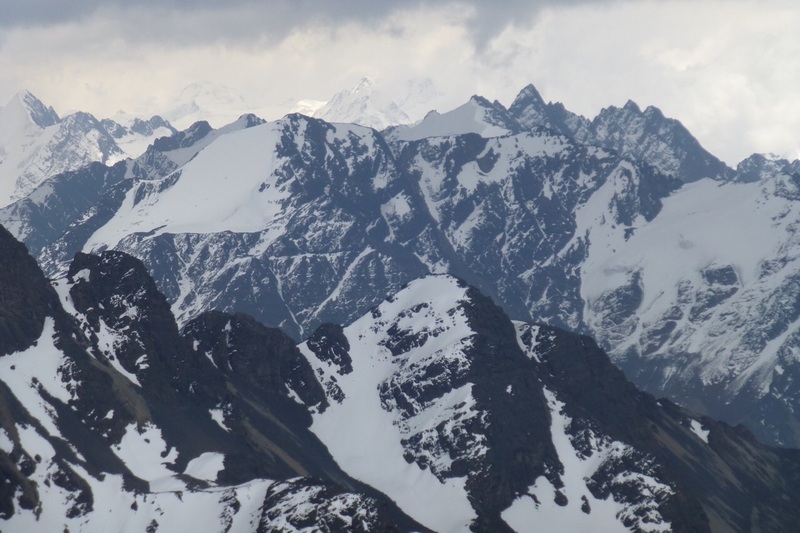 Summary: One gnarly mountain pass; summit Pico Austria at 17,454; 6 hours. It’s growing steadily colder as we ascend higher into the mountains. Last night I added a second base layer to my growing list of bedtime accoutrements and hardly noticed the addition. Today is supposed to be the most technically challenging day of the trek. We have a breakfast of warmed bread and eggs, then get started. Right off the bat, we have to walk a tight line along a steep mountain of scree to get around the lake. I can look only at my feet because if I look anywhere else, I’ll slide down the slope and belly-flop into the lake below. Most of the time, I’m not sure that what we’re walking on is a “trail” in the truest sense of the word. This has been a topic of brief debate. Tara and I think only 30% of what we’re walking on could be called a trail. Ryan thinks 50%. We compromise on 40%. This is the sort of thing that gets discussed when one is trekking. Well, this and numerous other crazy things, like toilets. After clearing this mountain of scree, we proceed to ascend a narrow ridgeline until we get to another lake with a massive, nearly vertical mound of stone next to it. Clearly, we can’t go up that thing, so I ask Marisol where the trail continues. Naturally, she points at the stone. It’s been years since I’ve done any bouldering, but when you boulder, you have the knowledge that there’s a crash pad somewhere beneath you that (hopefully) provides a cushion should a fall occur. This massive rock had no crash pad and a drop off the side could’ve had dire consequences. However, Marisol said this was it, so I went. I focused my attention on finding my hand holds and moving upwards. Most of the hand and foot holds are easy to find, but I get to a point where I’m not confident about my next move. Concentration broken, my mind begins to race and I think about what’s below me. Bad move…my leg starts to jackhammer. Thankfully, Poncho is there to direct my next move. I get out of that spot and the rest gets easier until we’re clear. I feel a bit incredulous that this is a normal part of the route, but I’m just happy to be done with it and continue on. After three hours of climbing, we finally reach the base of Pico Austria, which is our highest point of the trek. 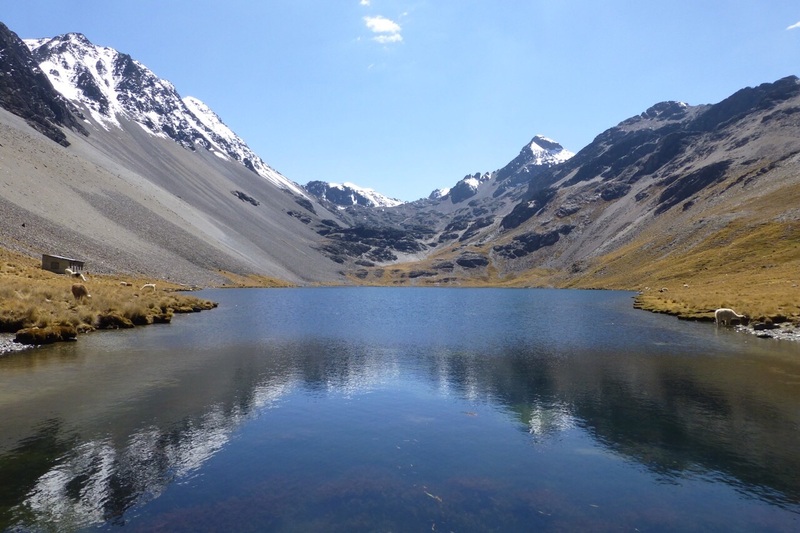 Pico Austria is low enough in altitude to be nearly free of snow, but is still a breathtaking 17,454 feet. For the first time since we started this trek, we see other people who have also come to summit the peak. After eating lunch, we begin our last push. When we reach the summit, it’s covered in apachetas—stones stacked upon each other and left as a landmark by previous trekkers. Beyond the apachetas is an intoxicating view of the snow-covered peaks of Tuni Condoriri and its neighbors, forming layers upon layers of mountains, extending into infinity. We enjoy a bit of the view and the sublime peacefulness until others start arriving. As we descend Pico Austria, we’re treated to a rare sighting: condors. The Andean condor is a sacred symbol of several South American countries, Bolivia included. Since condors are also a threatened species, catching a glimpse of one is an exciting event. We saw three, soaring high above us, playing upon the thermals. Marisol tells us that the locals believe that a condor sighting is a sign of snow or bad weather to come. It’s an interesting anecdote, but my logical mind disregards it as an old wives’ tale. As we descend to our camp, it begins to hail. Two mountain pass crossings at a high of 14,430; 7 hours. Stupid ! @#$ condors. The evening grew increasingly colder and there was ice on our tents this morning. I had to wear three wool base layers, three pairs of wool socks, and my down jacket to bed. It’s hard putting on multiple base layers when they’re all the same size. By the time I wriggled into my sleeping bag, I felt like a fat, squirming maggot. After breakfast, we head out into a moist, dense fog. Although yesterday was our most technically challenging day, this day will be much harder due to the frigid temperatures and low visibility. As we trek, there’s very little chitchat—we’re hunkered down and moving mechanically, in our own little worlds, hoping for a break in the fog and a peek at the sun. We’re so focused on getting to camp that we unanimously agree to forego lunch and press on. After many hours of this, we reach our intended campsite, but Marisol has already decided it would be too exposed in this wind and cold, so we pass it by. Finally, we reach the area Marisol has in mind. It’s not a campsite, but more of a grazing patch surrounded by the mountains, thus affording us some protection from the biting wind. The camp-iness level of this trek has just reached an all-time high. We need to pitch our tents before we lose the light of day, so I don’t even bother to clean away all the donkey poo that’s scattered over my tent site. (I tell myself that they only eat grass and I’m putting plastic over it, so what the hell.) I find a boulder near my tent that will provide enough cover for my “Inca toilet.” Since this isn’t an actual campsite, there is no structure for cooking, so our cook and muleteer set up a “mess tent” where we can be somewhat protected by the elements. We sit in that tent, shivering, drinking hot drinks and thinking warm thoughts. Descending. 2.5 hours…plus a bit extra. It’s the revenge of the condors. It rained all night and a thick fog still hangs low on the mountain. My tent is wet. My sleeping bag is wet. To explain how cold I am…sigh. It’s just too. much. effort. While we’re eating our breakfast, the rain turns into snow. Marisol says she’s never seen this kind of weather during the dry season. We finish our breakfast and begin our descent, which is blessedly short compared to previous days. In our hurry to return to civilization and away from this horrible weather, I hardly notice the ground and step directly into piles of donkey poo. At this point, I’m beyond caring. I am the female version of Grizzly Adams. I’m Grizzly Madam. Seriously, what’s a little donkey poo? All I can think about is warmth, hot liquid, and how much I’d love a steamy bath. As we quickly press on, the thick mountain fog gradually falls behind us as visions of civilization slowly creep in. It’s like a blanket being pulled from a bed: first we see a bridge, then an abandoned stone house, then electrical poles. Little by little, we leave a mountain range that has been both inspiring in its beauty and tormenting in its coldness, while the comforting signs of civilization take its place. We reach the end of our trek in Chacapampa, a tiny (and nearly empty) village. Like our first muleteer, our driver is nowhere to be found. It’s a bit of an anticlimactic end to our adventure, but the snow has made the pass difficult. We wait outside in the cold for a few more hours, moving and jumping to generate body heat, before he finally arrives. The van has a broken heater, surprising no one. I still hate camping. I also think this is the coldest I’ve ever been. I with you on camping. After three attempts to erect my tent in the summer I can categorically state it isn’t my gifting. On the other hand I have a pretty good strike rate with the Hotel magnetic key cards. Yup, I choose the latter for my overnight stays (wherever possible).